Family life with dogs is a joy, but can be challenging too. A new baby in the home changes everything—including your dog’s whole world. We know that your dog is a special part of your family. We also know how chaotic life can be with a new baby and pets all under the same roof. We are here to help you! Whether you’re expecting (or adopting) your first child, or you have a houseful of kids already, you can get expert help solving the challenges of family life with a dog. We offer professional support and guidance to help ease you into the transition from pet-parent to baby-parent. Together we can build lasting bonds one phase at a time! 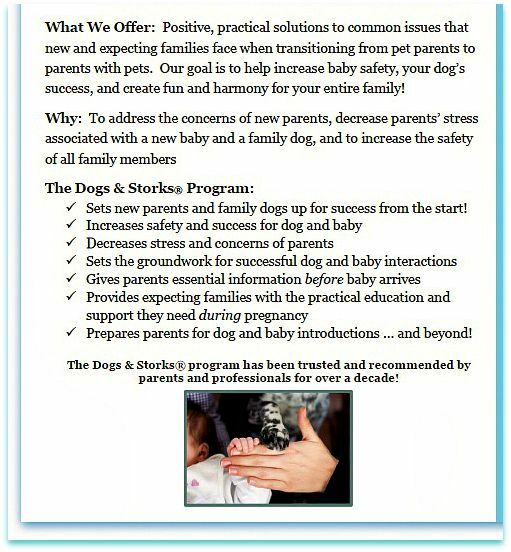 Family Paws™ Parent Education is the parent organization of two International licensed programs: Dogs & Storks® and Dogs & Toddlers™ . We provide specialized programs for new and expecting families with dogs. We offer a wide range of support to families, dog professionals and childbirth professionals to support success between babies, toddlers and family dogs.Our goal is to increase safety and reduce stress in homes with young children and family dogs. We seek to decrease the number of dogs surrendered to shelters due to preventable behavioral problems and common conflicts. Conscious Companion is a highly respected member of Family Paws Parent Education Advisory Team. I am a licensed educator of the Dogs & Storks® and the Dogs & Toddlers™ programs. I provide group presentations in the community, and I can teach you from the comfort of your home! Please contact us if you would like to learn more about how we can help your family. How to "Speak Dog" so you can understand what your dog is trying to tell you! Read how my services have impacted other families! Listen to a brief interview with PPG World Services where I discuss what our Family Paws Parent Education family can do for your family! Listen to Family Paws Parent Education's interview on IAABC’s podcast, Animal Cafe. See us in the Jan 2014 publication of FPPE in Dog Fancy! Check out the interviews for WRAL's GoAskMOM: Segment one, two, three, four, and five. Listen to Jennifer Shryock and Victoria Stilwell talking on the Positively Podcast. NEW: Grandparent Webinar: Learn what to do when your Grandkids visit! Are you a Grandparent with a dog? Do you have Grandkids that visit your home? Everyday life for your dog may be peaceful and predictable until the Grandkids arrive. Changes in schedules, energy and dynamics can cause even the most wonderful family dogs stress. Do you recognize subtle signals in your dog that may indicate stress? Plan ahead for busy family visits so that you can increase safety and decrease stress for all family members. Join us for this informative hour-long webinar where we will help you and your dog truly enjoy all family gatherings! Activities for success and so much more! Don’t miss this great opportunity to learn positive and practical tips you can begin right away to help make family visits more enjoyable for all!